Appalachian Voices’ Virginia Field Organizer Lara Mack (l) and friend Amy Cantrell from Harrisonburg. 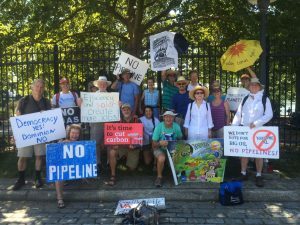 Last Saturday, more than 600 Virginians gathered at the footsteps of Governor McAuliffe’s mansion in Richmond to demand energy justice for all citizens of the Commonwealth. Chartered buses arrived from major cities including Hampton Roads, Charlottesville, Harrisonburg, and Roanoke, as well as rural areas like Nelson County and Montgomery County. This well-known song was written by Pete Seeger and Lee Hays in 1949 in support of social justice efforts of the time. For us, starting with the historical tune was a clear reminder that this march was not just about fracked-gas pipelines, climate change, coal ash, and renewable energy, but also about the stories and struggles of people impacted by corporate power and monied special interests. Our voices were represented in an open letter, signed by more than 60 organizations, sent to Governor McAuliffe last month. Saturday’s march was the next step; We walked as a part of a legacy for democracy, environmental justice, and the power of community. The bus arrived and the doors opened to a hazy and hot day on the banks of the James River. The temperature was expected to reach 99 degrees, which meant the day felt more like 104 degrees. We took a group photo before the march (why not get a photo of us before we all wilt?) with our signs and grins and enthusiasm easily seen in the snapshot. As other marchers slowly arrived from all corners of the Commonwealth, I saw the crowd of dedicated and concerned citizens grow. Many carried creative signs about the local issue their community was struggling with (my favorite was “NO PIPELINES. Especially [from schools] to prisons”). Though the messages were diverse, the overarching statement was very clear. We know what is best for our communities. We know that we can create a system that can be safe and healthy for all, that doesn’t create sacrifice zones or climate change to meet monolithic electricity production expectations, that doesn’t deny a person’s rights and humanity no matter their race, age, income or sexual orientation, or whether they live in the country or in the city. And the current system is not meeting our needs. 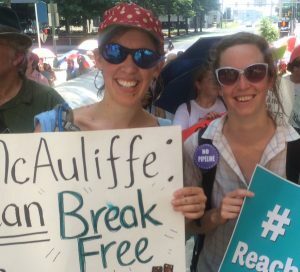 The “March on the Mansion” was a message directed at Governor Terry McAuliffe and our voices rang loud and clear. But as we gathered back on our buses to head home, I realized this gathering was also a reminder to all those in the crowd that we each carry a hammer, a bell, and a song and when we stand as a community together, we can get work done.